Deepen your sense of the past at sights like Vieille Ville and La Croisette. Villa & Jardins Ephrussi de Rothschild and Chateau de la Napoule / Musee Henry-Clews will appeal to museum buffs. When in Nice, make a side trip to see Centre d'art La Malmaison at Cannes in Cannes, approximately 50 minutes away. There's lots more to do: see the interesting displays at Musée Marc Chagall, explore the world behind art at Musee d'Art Moderne Et d'Art Contemporain, pause for some serene contemplation at St Nicholas Cathedral, and step into the grandiose world of Palais Lascaris. To find maps, where to stay, ratings, and tourist information, use the Nice trip planner . Perth, Australia to Nice is an approximately 24-hour flight. You can also do a combination of flight and train. Traveling from Perth to Nice, you'll gain 7 hours due to the time zone difference. Plan for a bit warmer nights when traveling from Perth in May since evenings lows in Nice dip to 16°C. Finish your sightseeing early on the 9th (Thu) so you can drive to Carcassonne Center. Kick off your visit on the 10th (Fri): step into the grandiose world of Cité de Carcassonne, steep yourself in history at La cité médiévale, and then take a stroll through Historic Fortified City of Carcassonne. 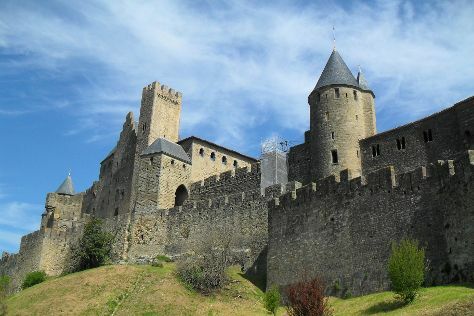 For other places to visit, maps, where to stay, and other tourist information, read Carcassonne Center online travel planner . Drive from Nice to Carcassonne Center in 4.5 hours. Alternatively, you can do a combination of flight and train; or take a train. Plan for little chillier nights when traveling from Nice in May since evenings lows in Carcassonne Center dip to 13°C. Cap off your sightseeing on the 10th (Fri) early enough to go by car to Avignon. Start off your visit on the 11th (Sat): don't miss a visit to Palais des Papes, take in the views from Pont d'Avignon, then explore the ancient world of Roman Theatre of Orange, then do a tasting at Chateau Fortia, and finally see the interesting displays at Musee Angladon. To see traveler tips, maps, photos, and more tourist information, read Avignon online day trip planner . Traveling by car from Carcassonne Center to Avignon takes 2.5 hours. Alternatively, you can take a train; or take a bus. May in Avignon sees daily highs of 27°C and lows of 13°C at night. Finish your sightseeing early on the 11th (Sat) so you can take a train to Marseille. On the 12th (Sun), get engrossed in the history at Paul Cezanne’s Studio, then take in the spiritual surroundings of Paroisse Cathédrale Saint Sauveur Aix-en-Provence, then see the interesting displays at Site Memorial du Camp des Milles, and finally contemplate in the serene atmosphere at Cathédrale La Major. On the 13th (Mon), you'll have a packed day of sightseeing: contemplate the long history of Maison de l'Echevin de Cabre, then contemplate in the serene atmosphere at Basilique Notre-Dame de la Garde, then contemplate in the serene atmosphere at Abbaye Saint Victor, and finally get engrossed in the history at Museum of European and Mediterranean Civilisations. To find reviews, more things to do, ratings, and more tourist information, use the Marseille trip site . Traveling by train from Avignon to Marseille takes an hour. Alternatively, you can drive; or take a bus. In May, plan for daily highs up to 26°C, and evening lows to 14°C. Finish your sightseeing early on the 13th (Mon) so you can travel back home.